I’m sat here, in my quiet little flat, watching the snow fall outside, wondering where to start with this blog post. I love it when I come across a book with a blurb that stirs my insides, that makes me want to find a soft chair, grab a coffee and start reading there and then, regardless of whether I need to clean, go to work, or shop! Those are the really special books. 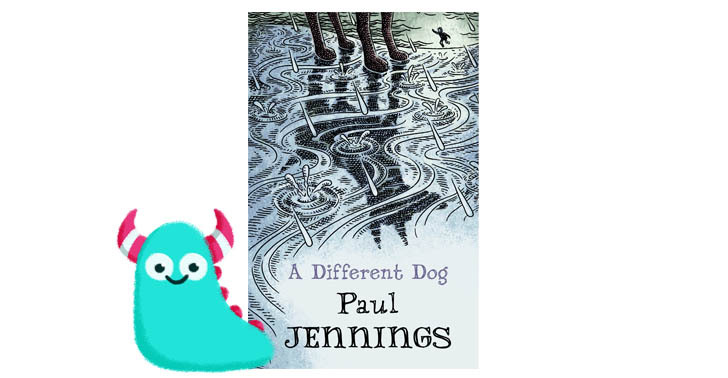 This is one such book, A Different Dog, written by Paul Jennings. Illustrated by Geoff Kelly and published by Old Barn Books. The blurb on the book is quite sparse, and hints at the story, which I love, it really gets you intrigued and interested, which is why I don’t want to spoil it too much in my review. So apologies now, if this seems vague and unhelpful, but I think sometimes stories should be read for the first time, if that makes sense. But to save this being a blog post of emptiness, I’ll tell you a little bit! 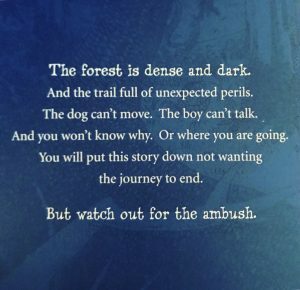 A Different Dog is told from the point of view of a young boy, who is unable to talk to anyone other than himself and animals. He’s a mute owing to some trauma in the past (which is eventually revealed). In an attempt to help his struggling mother by winning her some money, the boy sets out on a long journey. It’s on this journey that he meets “dog”. Dog, has his own issues, which are unclear at first, but again, are steadily revealed at the same pace as the boy’s. The two join forces, and essentially, one lost little dog, helps one lost little boy and one lost little boy, helps one lost little dog. This is a short story, very short. I gobbled it up in about an hour I would say, and really I loved that. We’re so tempted to write long epic adventures, but it’s just not necessary with this book. And what’s brilliant about that, is that, this quality fiction, is now accessible to a younger audience, or an audience less keen on reading monstrously huge books. And beautifully written it is. Paul Jennings has always been a master at the short story. I’ve read some hilariously funny tales by him, quirky and interesting. A Different Dog contains the same quirks, but with the added element of emotional pull. Honestly, if you wore a tie, it would grab you by it, shake you around, and gently drop you to the floor in a soggy heap. It sounds terrifying, but this emotional affect is what I search for in all my books! I love it when something really grips your heart and you feel the words pounding there for days after. Paul Jenning’s simply, yet perfectly crafted words are supported and enhanced by illustrations from Geoff Kelly. They very much reminded me of illustrations from books I read as a child in the 80s, simple ink drawings, providing just enough detail to entice, but creating more of an atmosphere than anything. The cover represents it perfectly, you can see hints of the story, the rain and running boy, a dog stood unmoving, all the emotion is there, yet we’re just getting hints and teasers to the story within. Perfectly done. I personally think this has the feel of a future classic book to me. It took me right back to my childhood when I picked up a book and read it and then never forgot (A Dog so Small is one that still stays with me). For such a short tale, it covers a huge number of very important areas including friendship, bullying, love, loss, trauma and empathy (in bucketfuls). Honestly. I’m completely lacking sufficient superlatives to express the true wonderfulness of A Different Dog, so I guess you’ll just have to get a copy and read this beauty for yourselves!! Please do, you won’t regret it. A Different Dog is due for release on 1st February 2018.